Ok, so I moved to England…ok. I’ve actually first got here about a month ago, but was home for about 4-5 days for my sister’s wedding (which was awesome), and spent about 2 days traveling back and forth (which was not). In that time, I have got the chance to do some pretty cool things already. However, its a bit different coming here and planning on staying as opposed to visiting, so I haven’t done too much in the way of sightseeing and touristing. I know touristing is not a word, but it should be…I know we all have our favorite non-words-that-should-be-words. So, England. I am currently staying with some relatives of mine just north of the Bradford/Leeds area. They are my Dad’s cousins and are thus my first cousins once removed and their children are my second cousins. They have been absolutely incredible hosts for me thus far and I can’t thank them enough. I have a host of other relatives nearby and throughout the country that I have both met and who I am looking forward to meeting. I have a rich family history from this area, which makes it even more exciting to be here. My grandmother (another person, I can’t thank enough) was born in Bradford and her brothers and sisters grew up here. Her father, my great grandfather, was actually a Bradford City (who were in the premier league not to long ago) player back in his day and so I hope he can give me a little extra inspiration as well! 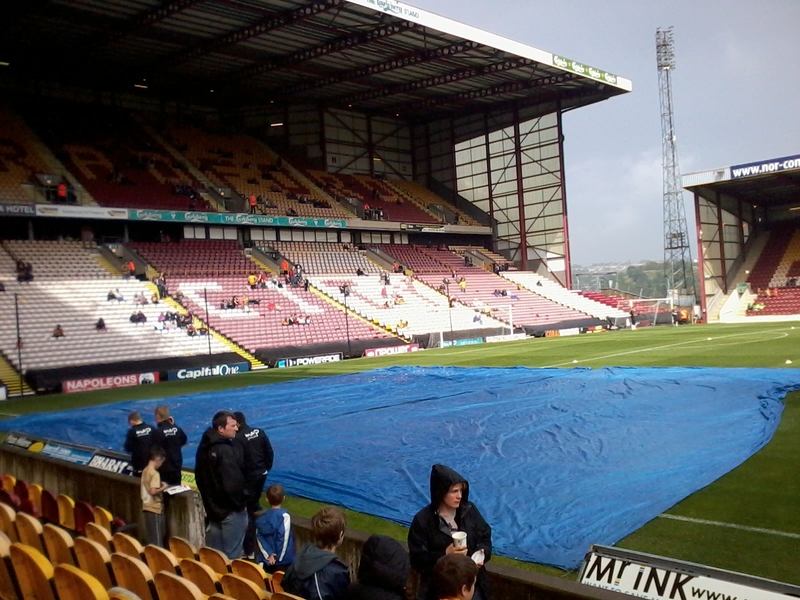 I got to go to a Bradford City game just a few days after I arrived here. 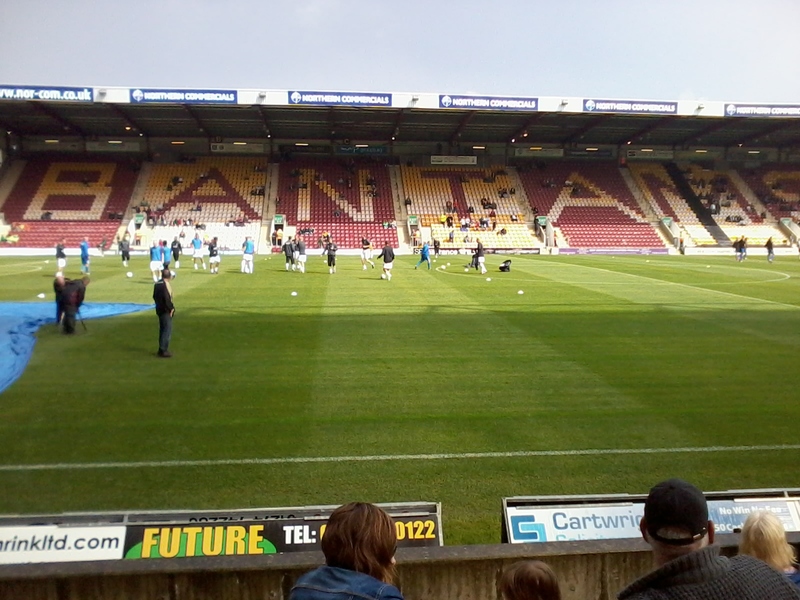 It was great, they have a great stadium and ended up winning 5-1 on the day vs AFC Wimbledon. Geographically speaking, Bradford and Leeds are only about 10 miles apart, and located in Yorkshire, right where the country starts to get skinny. Its probably about 3-4 hours away from London. See the little map below. It’s a decent location for access to teams, but then again, compared to the United States, just about anywhere in the UK is a good location for access to teams. Gone are the 12 hours bus rides up and down the east coast for games. I’ve heard complaints about 1 hour drives to away games. Please! That’s what I’m used to driving for a home game. I can’t complain. I have spent much of my time emailing, calling and visiting clubs within access of easy public transport. Which is a large number. Most of the bigger clubs, tier 5 and higher I would say, receive somewhere from 25-500 player inquiries a week. So, needless to say, the information from an unproven American, isn’t highly likely to make it to the top of the pile without any previous recommendations. Also, I came over to the country about a month too late, since most of the teams had there rosters sorted out as the season was starting. If I had come before preseason, I would have likely had more opportunities. However, I am slowly making inroads and connections and am confident thus far. I have been fortunate enough to be able to get out and see some things as well. 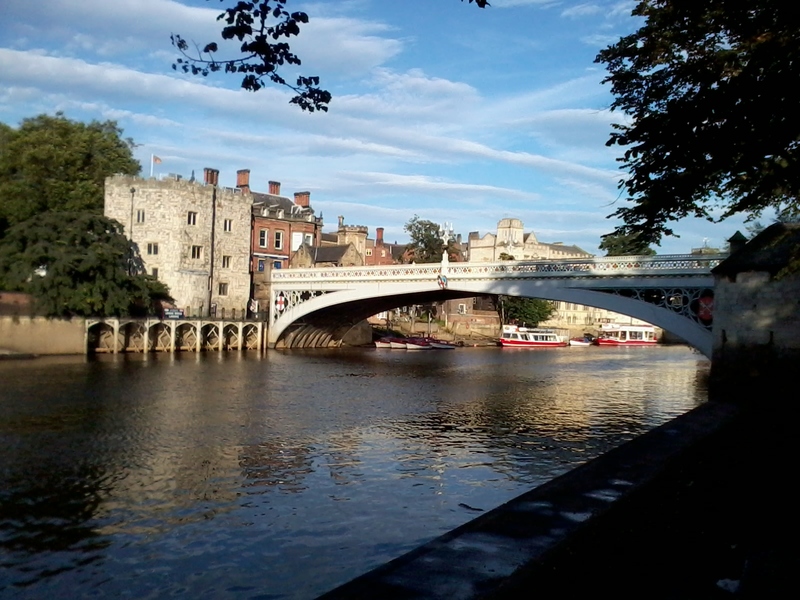 I went to York which is a very historical and beautiful city. 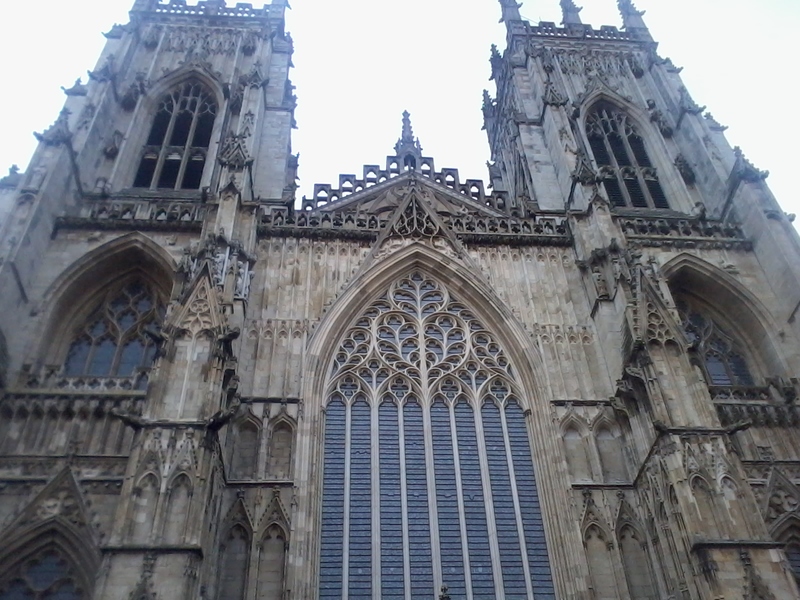 I remember the city from when me and my family visited here about 13 years ago. It is a walled City and has some structures dating back to the Romans. 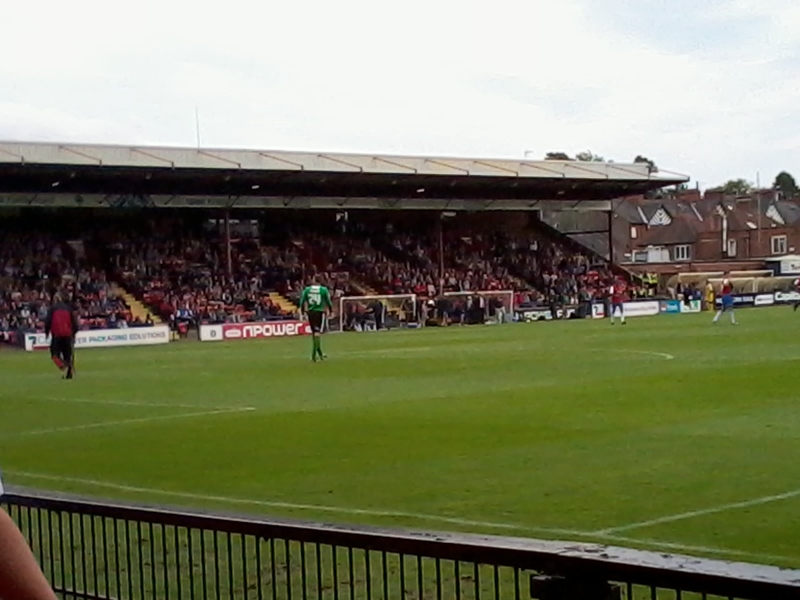 Yes, they also have a football team in League 2 (4th tier) called York City; I would love to get a chance with them. I went to a game, which they won 3-1 against Oxford United in a quant little 8,000ish seater stadium tucked into a neighborhood. It was a great game, in a great little atmosphere; something that is significantly lacking in the US. 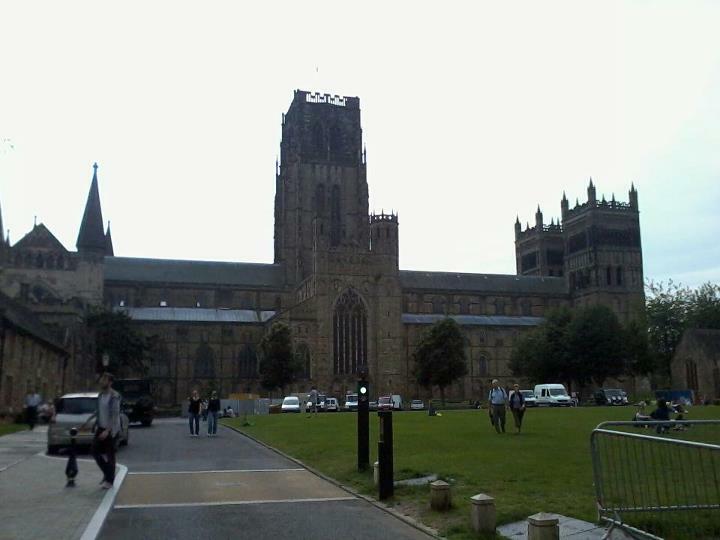 My only purely tourist trip was up to Durham, home to Durham Cathedral, which is one of the most impressive of its kind. It was a massively sturdy structure sitting on top of a hill on a bend in the Weir River. Very majestic and powerfull. 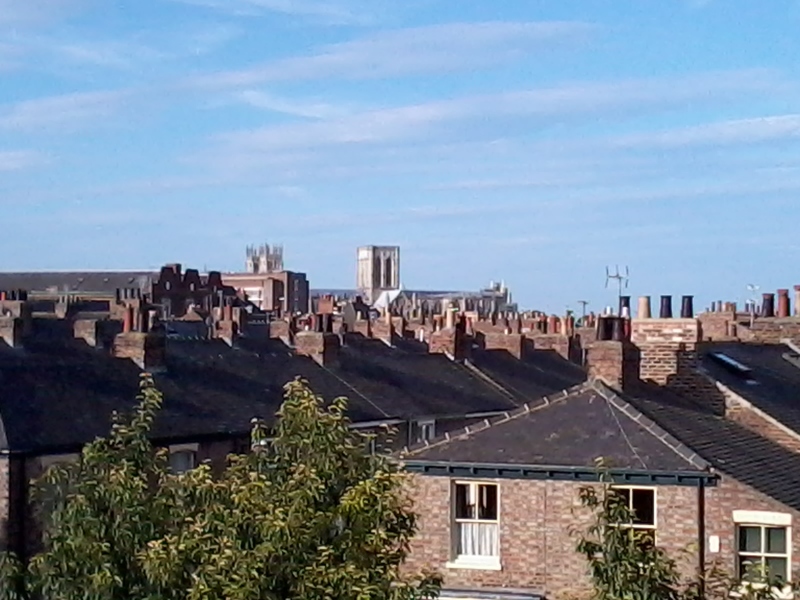 It is located up north, almost as far as Newcastle. My cousins were going up for a day trip and generously offered to take me along. It is another very historical place, steeped in history. The castle was one of the most northern strongholds in England, or so I am told. It is also the burial place of St. Bede and St. John Cuthburt. I was able to climb to the top of the main tower and get some great views of the surrounding area, which is historically an agricultural area. 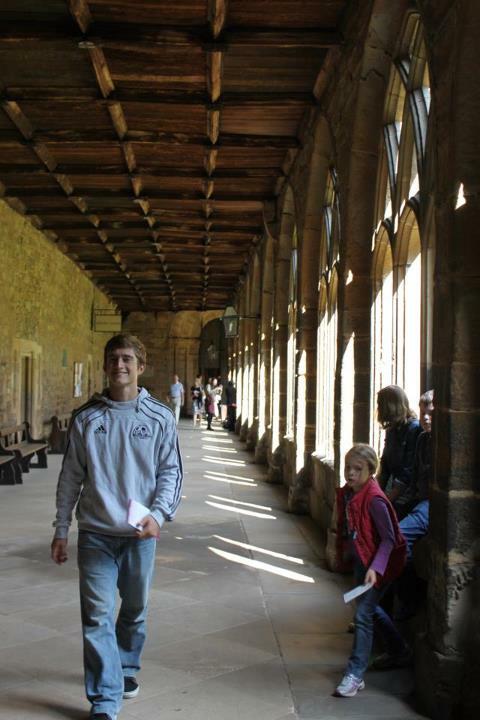 It has also been made famous, in recent years because parts of the Harry Potter series were filmed here. Here are a few shots! 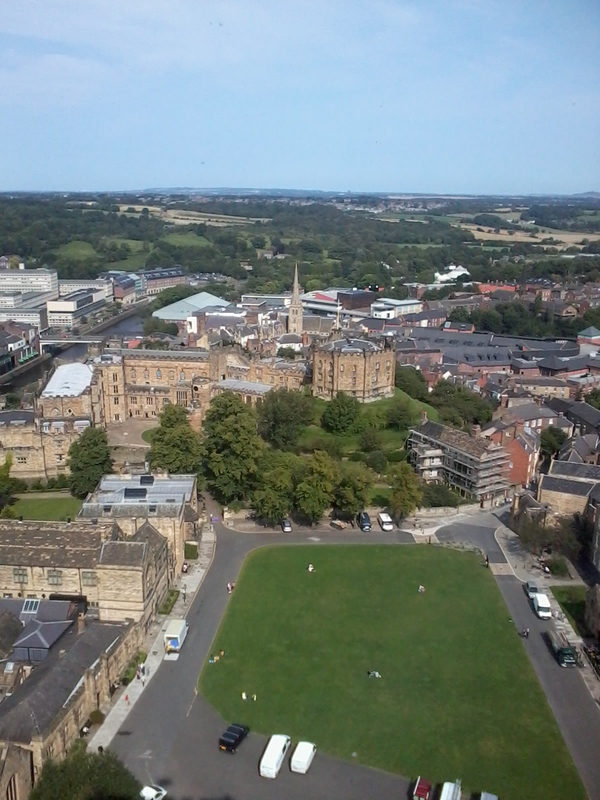 In the tower looking down to Durham castle, which currently houses student at Durham University! And finally! The highlight so far. 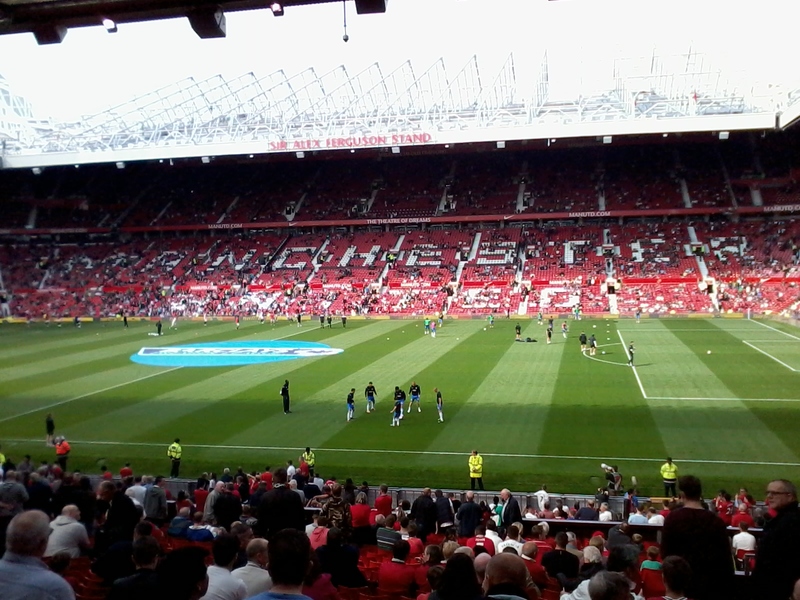 Going to a Manchester United game at Old Trafford! 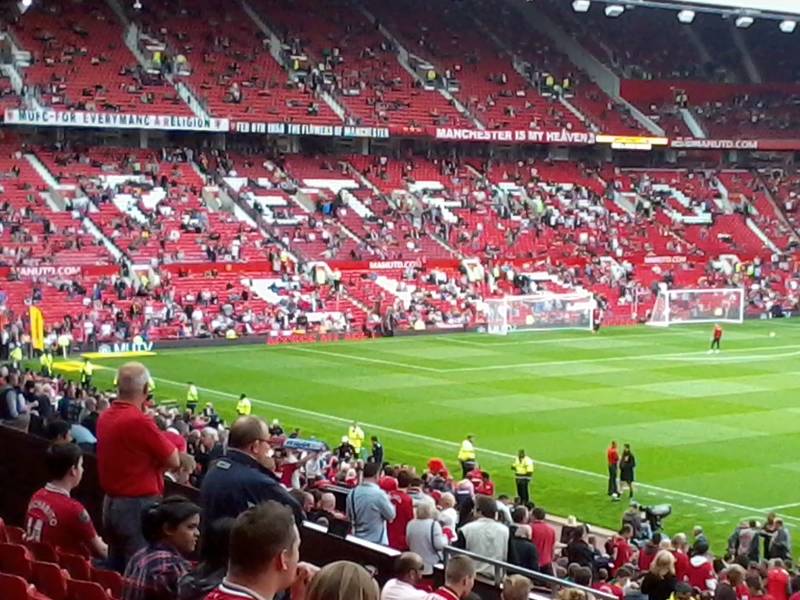 My cousin William and I got to cheer on the the Red Devils who won 4-0 in Paul Scholes’ 600th game, and the legend himself scored the opening goal. Before the game, Antonio Valencia was given the team MVP award from last season. Although he did not feature in the game. I also missed seeing Shinji Kagawa. Fortunately, though I did get a glimpse of Van Persie out on the field for the last 20 minutes. United was slow to start in the first half, but picked up and dominated the game in the end. It was also the debut game for both Buttner and Powell, both of whom scored: The future looks RED! I have to thank my cousin’s husband for kindly letting us use his season tickets for the game! They were great seats! Aside from that, playing has been my focus. I have been keeping myself as fit as possible on my own and getting used to being here. The support from everybody is what helps me through the lonely work outs. I will do my best to write something once a week or so, probably less comprehensive than this, but just little thoughts as I go on my way or maybe analysis of a game or two. So, keep an eye out if interested. I’d love to have feedback on this blog, or on this post in particular…please be honest! God Bless you all and don’t be afraid to dive head first. I didnt seek this, but I love this, found it entertaining! Keep up the excellent work!